If you’re looking for storage for a Mac, or just something that packs the style punches, the Iomega UltraMax Plus Desktop Hard Drive is worth considering. The look is clean, and there’s the dotted-grille design and aluminum shell that would look comfy coming out of Apple’s design labs. 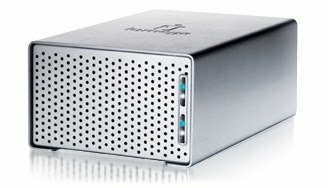 It also covers all manners of connectivity options – you get USB 2.0, FireWire 400, FireWire 800 and eSATA ports, which allow the UltraMax Plus to achieve impressive transfer speeds, if you have the relevant hardware on your Mac/PC like a FireWire 800 port or eSATA connection that is. It’s pricey, but the inclusion of speedier ports, a winning design and data protection features like RAID may make it worth your while.